The .375 Holland & Holland is a classic mainstay of big game hunting, and the ammo available today is better than ever before! 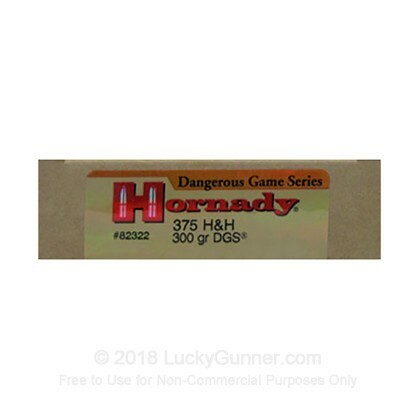 Gear up for your next trophy with this .375 H&H ammunition from Hornady's Dangerous Game Series. This ammo features a special "DGS" soft point bullet designed to expand rapidly and stop bears and other fearsome quarry in their tracks. Each round in this box of 20 fires a 300 grain version of the DGS at a muzzle velocity of 2,705 feet per second. We don't have any reviews yet for this particular .375 H&H Magnum ammo from Hornady. If you'd like to be the first to review this particular .375 H&H Magnum ammo from Hornady, fill out the form below.